Someone Just Won the $457M Powerball Jackpot! After a long rollover streak, the massive $457M US Powerball jackpot was finally won last Saturday, March 17. So far, nobody has come forward to claim the prize—which means you might have a shot. That is, if you live in Pennsylvania. If you do, then you might just be in the possession of the winning ticket! What are you waiting for? Hurry up and check your tickets! But hey, even if you didn’t get the massive jackpot—which is the eighth largest in Powerball history, by the way—there’s still other prizes to be won. For instance, two tickets matched all five main numbers, which means both get to take home the $1M second prize. However, one of them also had the Power Play activated, which increases their prize to $2M. You could be one of those two winners! Or, at the very least, you could be one of the 1,629,599 winners who won at least $4 each. The Mega Millions continues its rollover streak as last Friday’s draw—which offered a massive $345M jackpot—did not produce any grand prize winners. It means that, come Tuesday, March 20, the jackpot will increase to a whopping $377M, with a cash option of $225M. Of course, the secondary prizes are still up for grabs so better check your tickets before it’s too late! Overall, there were 1,105,849 tickets that have won at least $2 each. 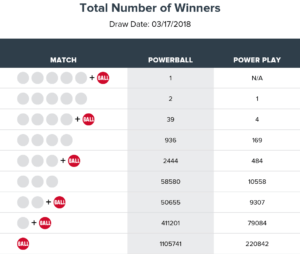 Four tickets, for instance, matched all five numbers, which means each winner will be taking home $1M. However, one of them had the Megaplier activated, so that lucky winner will be taking home a cool $3M instead. Who knows? You could be one of those four—or any of the other secondary prize winners! Bad news: nobody won the nearly £15M Euromillions jackpot during last Friday’s draw. The good news is that the Euromillions will now be offering a £22M jackpot this Tuesday, March 20, so you have way more incentive to buy another ticket. Then again, you could be one of the 3 lucky winners of the second prize worth £228,180.10 so you better check your numbers again! Did you match 5 main numbers and 1 lucky star? If you didn’t match any of the numbers, don’t worry. You can still win £1M thanks to the UK Millionaire Maker, so better double check your ticket again! Of course, there’s also other prize tiers to consider. There were a total of 2,115,416 winners after all, so it’s not far-fetched to say that if you participated in the March 16 draw, you could be one of them! UK’s National Lottery was the victim of a security breach that saw hackers attempt to access online player accounts starting March 7. Officials believe that some 150 accounts may have been accessed by the hackers using a technique called “credential stuffing,” though they have notified over 10 million users to change their passwords as a precautionary measure. They have already involved the police as well as the National Cyber Security Centre. National Lottery officials assures players that they don’t keep full debit or credit card details on player accounts. However, it’s highly likely that the hackers were able to get some email addresses and passwords—data that fraudsters will pay a decent sum for. So, if you have an online account with the National Lottery, better not dilly-dally! Change your password now! The Menomonee Falls Police Department is currently on the hunt for two men and one woman, all with ages of around 50-60 years-old. 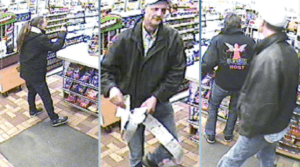 The trio was caught on camera stealing lottery tickets from a Speedway store located on Main Street at around 4:52 a.m. last Saturday, March 17. According to police, the woman served as a distraction—by talking to the store clerk and even dropping a wine bottle on purpose—while her accomplices took off with a total of 113 scratch-off tickets. Officials described the woman as a white, brown-haired female with a ponytail. She was sporting a black hoodie, dark blue pants, and had orange sunglasses on. She was also carrying a brown purse. The two accomplices, meanwhile, are both white males. One had brown hair and a moustache and was wearing a black hoodie that had an orange angel design on the front, while the word “HOST” was written on the back. Finally, the other man was wearing a white baseball cap, a leather jacket, light blue jeans, and brown work boots. Officials have also said that this robbery may be related to a similar case being handled by the Grafton Police Department. The owner of the £1M Euromillions ticket that was bought in Dundee on November 14 of last year still hasn’t come forward to claim his/her prize. If you purchased a Euromillions ticket in that area and on that date, then you could be the mystery winner they have been looking for! If you are the lucky winner, take note that you have only until midnight on May 13 to claim your prize. Better come forward with your winning ticket, pronto!